Tidal cracks are linear features that appear parallel to coastlines in fast ice regions due to the actions of periodic and non-periodic sea level oscillations. They can influence energy and heat exchange between the ocean, ice, and atmosphere, as well as human activities. 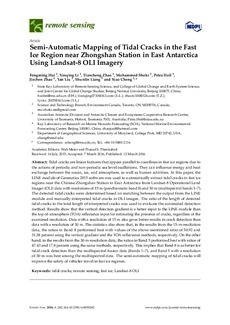 In this paper, the LINE module of Geomatics 2015 software was used to automatically extract tidal cracks in fast ice regions near the Chinese Zhongshan Station in East Antarctica from Landsat-8 Operational Land Imager (OLI) data with resolutions of 15 m (panchromatic band 8) and 30 m (multispectral bands 1�. The detected tidal cracks were determined based on matching between the output from the LINE module and manually-interpreted tidal cracks in OLI images. The ratio of the length of detected tidal cracks to the total length of interpreted cracks was used to evaluate the automated detection method. Results show that the vertical direction gradient is a better input to the LINE module than the top-of-atmosphere (TOA) reflectance input for estimating the presence of cracks, regardless of the examined resolution. Data with a resolution of 15 m also gives better results in crack detection than data with a resolution of 30 m. The statistics also show that, in the results from the 15-m-resolution data, the ratios in Band 8 performed best with values of the above-mentioned ratio of 50.92 and 31.38 percent using the vertical gradient and the TOA reflectance methods, respectively. On the other hand, in the results from the 30-m-resolution data, the ratios in Band 5 performed best with ratios of 47.43 and 17.8 percent using the same methods, respectively. This implies that Band 8 was better for tidal crack detection than the multispectral fusion data (Bands 1�, and Band 5 with a resolution of 30 m was best among the multispectral data. The semi-automatic mapping of tidal cracks will improve the safety of vehicles travel in fast ice regimes.